I was at Ikea this weekend and I found the cutest little succulents. The next day while thrift store shopping with my sister I found containers to put them in. They look great! Now let's hope I can keep them alive. Trying to come up with things to plant my little succulents in was the inspiration for this week's Etsy Treasury. Enjoy! Below are the plants I bought and a couple that I've potted so far. Yes, I potted them in candle holders. I heard (thanks Mom!) that you can break pieces off of these plants and start new plants. So I'm going to start a couple in some teacups I have. I love the candle holder idea! I've heard that, too, about breaking off little pieces and starting new plants. Good luck. 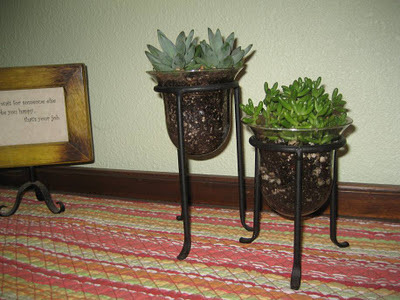 Thanks for using my planter in your treasury! So lovely! Thanks so much for including me! I absolutely love succulents and you just inspired me to go out and get some more!!! and to find some really cool new containers for them.